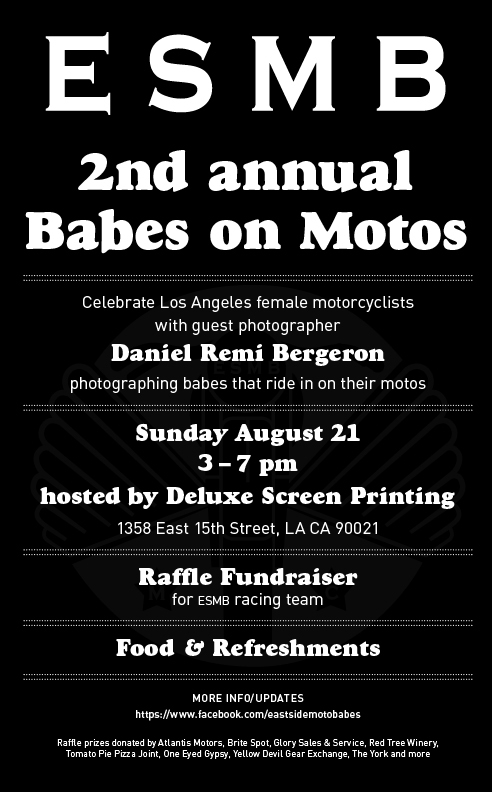 Join us for our Second Annual Babes on Motos this Sunday August 21 from 3 to 7pm. who will be photographing babes that ride in on their motos and documenting Los Angeles female motorcyclists. There will be a raffle fundraiser for the ESMB racing team, who's next race is September 2-4 at the Bonneville Vintage GP at Miller Motorsports Park, Tooele, UT. Atlantis Motors, Brite Spot Family Restaurant, Glory Sales & Service, Hell Fire Canyon Club, Keep Company, La Moonette, One Eyed Gypsy, Pro Italia, Redtree Wines, Tlon Salon, Tomato Pie Pizza Joint, Track Daz, Yellow Devil Gear Exchange, The York, +more. For more information and updates visit the ESMB facebook page.